Xmstar products are designed and developed by our experienced and professional team.We are striving to maintain the highest quality standards for your ultimate using experience.And please feel free to send us an email if you have any suggestion regarding the Xmstar product or service.Xmstar customer service team would continue to do our best to win 100% customer satisfaction. Your life could be more interesting with the smart plug. "Alexa,turn on the light" "OK"
Turn on the light and air conditioner through your mobile phone before you arrive home. Set on a time to turn on/off on your appliance when you are not at home. Stay in the bedroom,but giving an order to control the light in living room. Turn on a light or coffee maker before you get out of bed. With timer function,limit your kids of computer game time. Make all these happen with our WiFi smart plug. 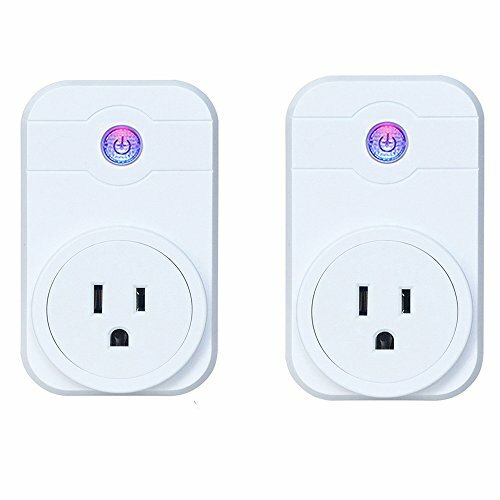 Smart plug compatible with Alexa and works with Google Home for voice controlling.No Hub Required. Instructional manual for Easy Installing and Connecting to WIFI. Control your home appliance directly from your iPhone, iPad, iPod touch or Android device. Use Timer-mode to turn devices on and off at different times. Energy Saving: Save on your electric bills and extend product life. Compact design to save your space. DIY your favorite scene:Auto turn on/off according to your schedule. 1.Voice Control:Smart plug works with Google Home and compatible with Alexa for voice controlling.Control your home appliance through Alexa ,Google Assistant or mobile phone. 2.Remote Control:The smart plug could be controlled via the free APP on your smart phone wherever you have Internet ,IOS and Android device are available. 3.DIY Your Smart Scene:Automatically turn on the light when you arrive home,or turn it off when you leave.Set a temperature, weather ,humidity, PM2.5 etc. to automatically active the device. 4.Timing Function:Schedule the Smart Plug automatically to turn on / off your light, fan,air-conditioner, water heater and etc,helping you to save your power and bill. 5.1 Year Warranty:Unconditionally refund or free replace if defective or any quality problems.We provide 24/7/365 kindly service.Please feel free to email us if you met any problem in using our product. If you have any questions about this product by Xmstar, contact us by completing and submitting the form below. If you are looking for a specif part number, please include it with your message.